Okay, I really have only the most rudimentary understanding of how things are done here in Deutschland (and obviously there’s no one “German way”), but it’s a rare day I don’t notice something that reminds me I truly am living in a land not my own. When it comes to parking practices, I’m reminded of that every single time I go out. Street parking (or so I hear) can be very hard to find, meaning drivers become incredibly inventive when it comes to making room for their cars. This picture (purposely fuzzy to protect the auto’s anonymity) shows a quite popular technique. 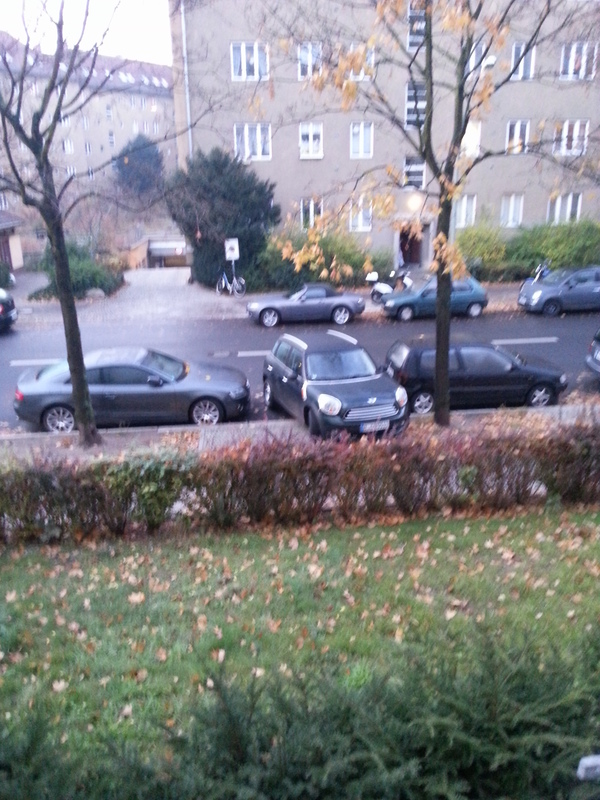 Not enough room to parallel park? Not a problem, as you can see. And apparently it really is no problem since I’ve yet to see one of these sidewalk-hoggers sporting a ticket. Another trick I see all the time is parking on the curve of a corner. The teeny tiny cars claim the advantage with this move, of course, but even large trucks get in on the action when there’s no better alternative. Just remember, all of you reading this – unless you’re also in Germany, don’t try this at home!